From Google and Microsoft to Tesla and Boeing, workforce development is a major issue for technology-driven U.S. companies. To stay ahead on the innovation curve, tech companies need access to a steady supply of workers educated in science, technology, engineering and math (STEM). That’s true for Rogue Valley Microdevices as well, and it’s one just reason why we support STEM education for youth. 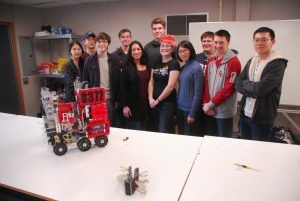 Late last year, we began sponsoring one of southern Oregon’s robotics teams, FTC 8372 Trial N Terror a.k.a. TNT. TNT is a member of the FIRST Tech Challenge, a competition involving 6,000 teams from 21 countries around the world, 205 of which are based in Oregon. Team members work collaboratively to design, build and program a robot that competes in a 12′ x 12′ arena with three other teams. Using Java and Solid Works computer aided design (CAD) as well as 3D printing, machining, and engineering design notebooks — the same types of programming and design tools and techniques that college-level and professional engineers employ in the field — gives team members a realistic taste of the engineering process. FIRST Tech Challenge robotic competitions are a far cry from the old Rock ‘Em Sock ‘Em Robots of the past. Each match lasts for 2 minutes 30 seconds with a 30-second autonomous period and 2-minute drive period. One can play offense and defense, and the goal is to score as many points as possible. The season begins in September when the new challenge is announced. Local tournaments begin in November with successful teams progressing to state, FTC West (13-state tournament), and ultimately to the World Championships in April. Team TNT just capped off an amazing season at the 2018 World Championships in Houston, ultimately finishing in the top 1% of teams worldwide. 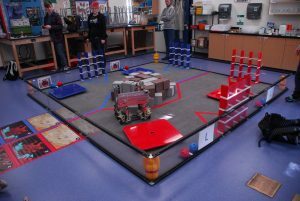 Above: Relic Recovery in this year’s FIRST Tech Challenge. The effects of Team TNT seem to endure far beyond FIRST Tech Challenge competitions. Kent pointed out that of the four graduating students from last year’s team, one is studying mechanical engineering at Oregon State and earned a prestigious summer internship at the NASA Jet Propulsion Lab because of this robotics experience. A second student won the Ford Motor Company International Design Competition (outperforming a pool of 320 applicants from college and high school) and secured a major scholarship to an automotive design school. A third student hopes to become a neurosurgeon and is currently pre-med at the University of Oregon. A fourth is studying mathematics at the University of Portland. Three of these students are women. Sponsoring FIRST Tech Challenge teams like TNT is critical to the success of the program. The minimum cost for a team is about $3,500, which covers parts, electronics, computers and tournament fees. The optimal level of support, however, is closer to $10,000. Every dollar goes directly to teams because of people like Kent Dauterman, who volunteer their time to help inspire future generations of young people pursuing STEM careers. Above: Team TNT members with Rogue Valley Microdevices CEO Jessica Gomez at center. On a personal and professional level, I am delighted to have Rogue Valley Microdevices sponsor Team TNT. When I spent a Saturday morning with Team TNT members and Kent Dauterman, I experienced the challenge – and the fun — of playing this year’s challenge, Relic Recovery. I look forward to spending more time with future Team TNT members as they pursue the joy of discovery, the spirit of teamwork, and the satisfaction gained through technical collaboration. For an inspiring video that will make you want to coach your own robotics team, watch the short video, “This Isn’t a Robot”. For more information on the objectives, rules and scoring of Relic Recovery, click here.